Photo Credit: Greg Parker & Noel Carboni. CLICK photo to view larger size and see below for links and information. What a terrific job with this object, I simply love how the color in these stars shows up. 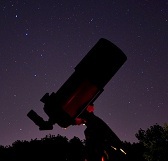 This is an asterism known as Kemble’s Cascade and if you live in the northern hemisphere and you own even a pair of binoculars you can go see this object tonight! An asterism is a recognizable pattern of stars that is not one of the 88 modern constellations; like the big and little dipper, summer triangle, winter hexagon or winter triangle, sickle etc. By the title of the post you may have deduced that this asterism resides in the northern hemisphere constellation Camelopardalis “the giraffe.” It was originally created as a camel by Jakob Bartsch in 1624 but later changed to giraffe but don’t tell anyone. It’s not a very pleasing constellation; in fact none of its stars shine brighter than 4th magnitude so even seeing this giraffle isn’t easy. Kemble’s Cascade however is a beautiful sight once you know where to look for it. In the late 70’s Canadian astronomer Lucian Kembel was stargazing with his 7 X 35 binoculars when he came across this cascade pouring into open star cluster NGC 1502. The asterism was later named in his honor by Walter Scott Houston. It’s comprised of about 20 unrelated stars matched up in a chance alignment, most are 9th magnitude stars so they’re beyond naked eye vision. In the middle of the cascade is a brighter 5th magnitude star to help you orientate. There are two other asterisms and an asteroid associated with Mr. Kemble; Kemble 2, Kemble’s Kite and asteroid 78431 Kemble. Go check out the links below to see more work from Greg & Noel as well as a page on how to locate this object. NAME: Kemble’s Cascade & NGC 1502. WHAT IS IT? 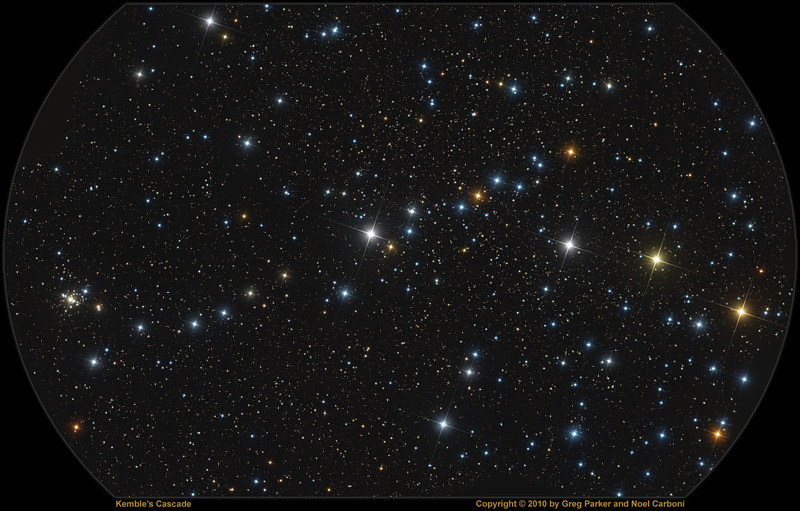 : Asterism of about 20 stars in alignment leading to open star cluster NGC 1502. HOW BIG IS IT? : Stretches about 2.5 degrees on the night sky or about 5 full moon widths. APPARENT MAGNITUDE? : Binocular vision 9 or +9. WHERE IS IT? (Exact RA/DEC J2000): RA 3h 57m 52s / DEC+63° 7′ 11″. Image | This entry was posted in Astronomy (Learning), Astrophotography (Wide Field), Images, People, Stars (Non-Sun Related) and tagged Astronomy, Astrophotography, Cosmos, Kembles Cascade, NGC1502, Science, Space, Stars. Bookmark the permalink.